The bungalow in Calpe / Calp has 3 bedrooms and has capacity for 6 people. The bungalow is comfortable, is modern, and is 90 m². It has views of the mountain and the garden. 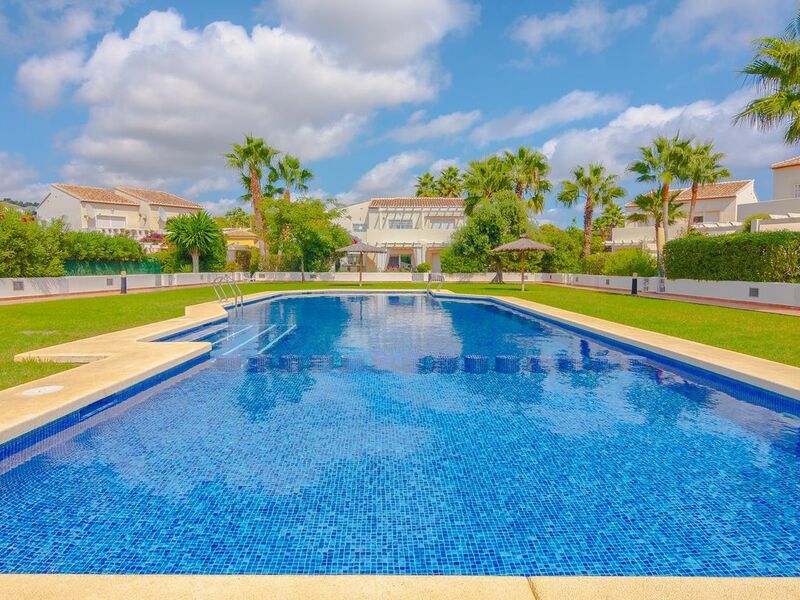 The property is located 1 km from Supermercado La Fustera, 03720 Benisa, Alicante supermarket, 2 km from Playa Cala Fustera,Benissa sand beach, 2 km from Playa Cala Fustera,Benissa rock beach, 4 km from Les Salines, Calp , 4 km from Calp, Alicante city, 8 km from Club de Golf Ifach, Calle Micheta, 5, Ctra Moraira a Calpe, Km, 3. Urb. San Jaime, 03720 Benisa golf course, 25 km from Aqualandia, Sierra Helada, s/n, 03503 Benidorm, Alicante water park, 30 km from Terra Mítica, Partida del Moralet, s/n, 03502 Benidorm, Alicante amusement park / theme park, 80 km from Aeropuerto Alicante-Altet, 03195, Alicante airport. The house is situated in a family-friendly neighborhood in a suburb. The accommodation is equipped with the following items: garden, garden furniture, fenced garden, 40 m² terrace, barbecue, internet (Wi-Fi), balcony, electric heating, air-conditioned, communal+children's swimming pool, covered parking in the same building, 1 TV, tv satellite (Languages: Spanish, English, German, Dutch, French). In the mixed: gas and electric open plan kitchen, refrigerator, microwave, oven, freezer, washing machine, dishwasher, dishes/cutlery, kitchen utensils, coffee machine, toaster and kettle are provided. Calpe is a municipality in the Spanish province of Alicante, in the Valencian region. It has an area of 16 square miles and is situated roughly 44 miles north of Alicante. In 2001, the town reported a population of 18,881 people. Writers such as Hemingway stayed extensively in Calpe in the 1930’s. The first hotel was built directly next to the Peñón cliff: the “Ifach Parador”. Calpe is a very popular place to visit on the Costa Blanca. Still, you will run into few tourists here. The surrounding area is hilly, and in the town you will find museums, small picturesque streets, and many different plazas. There are countless hole-in-the-wall restaurants and bars, many of which have little cheerful terraces. Calpe is full of culture and history. Its strategic location has drawn many different cultures together over the years. Evidence of early Iberian settlement can be found around the Peñón de Ifach. Later, the Romans built their own flourishing settlement here, based around the trade and production of salted fish. During the Middle Ages this area consisted of small municipalities spread over multiple villages and towns. The Christians and Muslims lived together peacefully, but were constantly under fire from pirates. In the 18th century the pirates were dealt with and were no longer a threat to the resurrection of the area previously settled by the Romans and the Iberians and the foundations were laid for the well-being of the city known today for its tourism. Calpe ’s attractions have made the town a destination for tourists from both Spain as well as abroad, who live together all year long in perfect harmony. Nearest airport (Alicante): 47 miles . Valencia airport: 69 miles. Trainstation to Alicante and Denia: less than 1 mile. The Morro del Toix and the Peñón de Ifach represent the extremes of the bay of Calpe. The Peñón de Ifach (Ifach means “north” in Phoenician) is the de facto symbol of Calpe , and perhaps also that of the Costa Blanca . It is the highest cliff in the Mediterranean and cleaves Calpe ’s coastline in two. This limestone mass is 332 metres high and extends into the sea for more than half a mile, creating a unique geological phenomenon. Since 1987 the unique ecology of the Ifach has been protected in the form of a national park. Groups can visit the top of the cliff. The rich variety of flora and fauna is explained in the nearby nature centre. From the top of the cliff you can sit back and enjoy one of the absolute best views of the Costa Blanca. Prehistoric, Iberian, Phoenician, and Roman artefacts have been discovered at the foot of the Peñón, on the strip of land that connects the cliff with the coast. At the foot of the cliff also lie the ‘Baños de la Reina’ (literally, the queen’s baths) that were in actuality used by the Romans for drying and salting fish. Between Les Bassetes and the Morro de Toix, Calpe has a long 7 miles coast with sand beaches – such as the Levante and Arenal beaches – and bays such as those at La Manzanera (where you can find three buildings designed by Ricardo Bofill), and the Les Urques bay, where it is possible to go fishing or snorkeling. The Cueva dels Coloms, in the Morro de Troix, that looks out over Altea, is a freshwater grotto that is accessible only from the sea. Calpe has many beautiful sand beaches, promenades, a great variety of restaurants, extensive choice in shopping, and a beautiful yacht harbour. On the boulevard that leads from the harbor to the town centre you can find the ‘Baños de la Reina.’ These are baths that belong to an old Roman pickling factory. In the centre of Calpe (but also in the surrounding area) you will find plenty of places to go out till every hour of the night. The immediate surroundings offer countless possibilities for excursions, such as sailing tours to Mallorca or bus tours to the towns in the nearby mountains. Calpe is also not far from Benidorm, where you can find multiple amusement parks, such as Terra Mítica , Spain ’s first theme park. This park is divided into five areas; the five lost civilisations of yore and the attractions will take you back to the myths and legends of these ancient cultures. Aqualandia is a water park where all ages can spend an unforgettable day in the many swimming pools with diving boards, lazy rivers, waterfalls, and water slides. For a tour of beautiful exotic animals and sea creatures, as well as various shows and other attractions you can visit Safari Park Vergel or the Mundomar zoo. Typical Spanish dishes are highly available in Calpe. The trademark dish of this area (as well as the entire Costa Blanca ) is undoubtedly rice. It is prepared more than 300 different ways. In the mountains, rice is cooked in a unique style of pot and is processed into one of the ingredients, together with pork, sausage, pumpkin, turnips, white beets, green peas, and beans. Near the sea, restaurants will almost always have fish, shellfish, and other seafood on the menu. The countless (fish) restaurants in the harbours offer you the most delicious local specialties: dorade, Lubina a la Sal (in a salt crust) or grilled with a bit of olive oil, garlic and lemon juice. The cuisine on the Costa Blanca also offers sweet desserts, such as nougat and ice cream from Xixona, grapes, raisins and dates, almond pie, and syrup-drenched pastries with coffee liquor from Alcoy and spiced liquor from the Sierra Mariola. The best red, light red, and blush wines come from the areas of Alto Vinalopó and the Marina Alta. The Peñón de Ifach is famous with climbers because of its difficulty grade, and can be climbed via different routes. Spelunkers can pay a visit to the Monte Oltá and the Barranc del Mascarat. On top of this, golfing, playing tennis, sailing, horseback riding, surfing, and diving are some of the many other activities that Calpe has to offer. The holiday houses, holiday villas, and holiday apartments are located in the well-developed and hilly neighbourhoods of Calpe. The accommodations are close to the Mediterranean Sea.